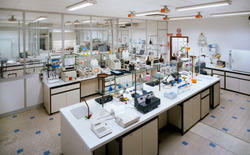 We are a leading Wholesale Trader of laboratory wares from Vadodara, India. We caters to the needs of various segments which include Pharmaceuticals, Biotech, Microbiology, Cell culture, Quality testing, petrochemicals, Food, Dairy, Beverage, textile, Specialty chemicals, chemicals for textile, leather, paper, paint, rubber, fertilizer, engineering, oil and many others. Laboratory Bottles, screw caps, desicators, dishes.